Eric Thomson competing at Hong Kong Race Week in February. Hong Kong Race Week 2019 saw Guam’s first-ever competitive entry and this year’s only U.S. representative, with Eric Thomson, 15, and coach Made Bradley, 18, of Marianas Yacht Club. 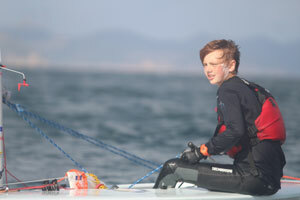 Eric, sailing in his first international regatta, placed 24th out of 33 entries in the Laser 4.7 class of boats, the second largest fleet out of 245 total entries this year. Racing wrapped up February 17. As a youth-centric event with more than 240 competitors from 10 nations, HKRW was a chance for making friends as well. “I connected with folks from the Macau team, and that was special for both of us because it was their first time competing at HKRW as well.” Eric and Made exchanged “burgees,” yacht club flags, with Team Macau, the Royal Hong Kong Yacht Club, and Team China as part of racing tradition. The race days were long, waking at 5:30 a.m. for breakfast and then making the journey from metropolitan Middle Island, Hong Kong, to the Royal Hong Kong Yacht Club’s Repulse Bay location. After a 30-minute sail to the race course, the fleets would race three to four times consecutively with only a short break between. “We had to sail from the end of one race course to get to the start of the next, and that was our time for eating and re-hydrating,” Eric said. By sunset, sailors would return their equipment to the dock, capping a more than 12-hour day, totaling 14 races over four days. While recovering from the aggressive daily schedule, Eric and Made had a little time to enjoy Hong Kong’s food and colorful atmosphere, which they say they hope to explore more another time, perhaps next year at HKRW 2020. 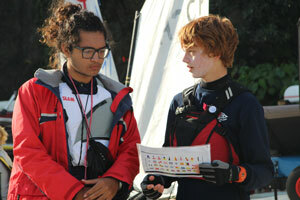 Both Eric Thomson and Made Bradley will compete in this weekend’s 41st Goodwill Regatta at the Marianas Yacht Club.